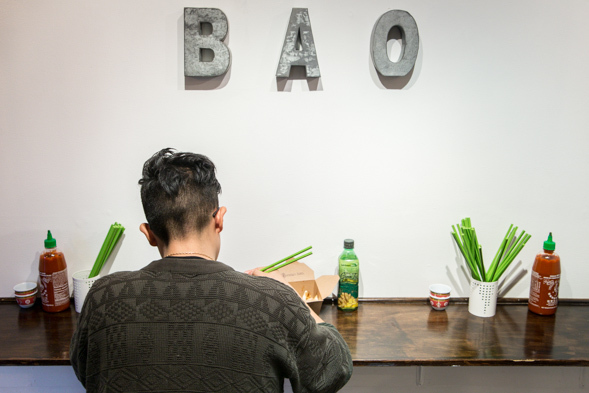 Mean Bao started as a food court vendor in Village by the Grange , and has now opened a second outpost on Bathurst south of Queen Street. The new location is primarily a take-out operation, outfitted with just a handful of stools for those that don't mind eating elbow-to-elbow in cramped quarters. 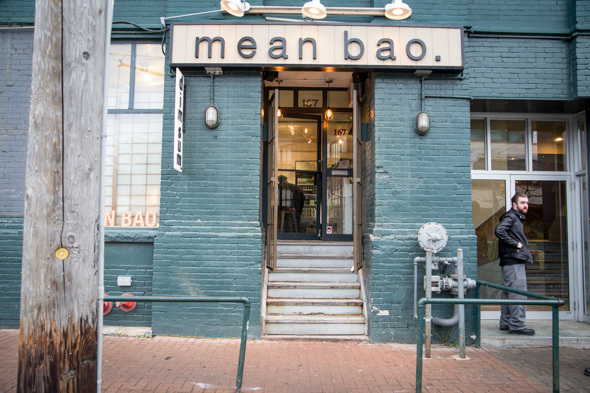 This address has seen a fair share of turnover in recent years - YJ Sushi Box, Deli Downstairs, and The Burger Press were all short lived residents - but Mean Bao seems poised to break the streak. At just three weeks old, the place is already enjoying brisk business at lunch and during rush hour, while delivery via orderit.ca is rather attractive for those looking for cheap eats dropped off at your door. The menu lists half a dozen steamed buns ($3.45-$3.60) including options like pork belly, chicken, braised beef, pulled pork, tofu and enoki mushrooms, or the house specialty, the "Sloppy Jones". Fans of the original location can "grange" any bao, which means all-dressed with pickled daikon, carrots, red pepper, cucumber and sprigs of cilantro, or enjoy each option as advertised, with fillings paired to unique combinations of Taiwanese-style pickles and condiments. The pork belly for example, is dressed with crunchy cucumber, hoisin sauce, crushed peanuts and cilantro, while the flavourful pulled pork comes loaded with tart apple and cabbage slaw. 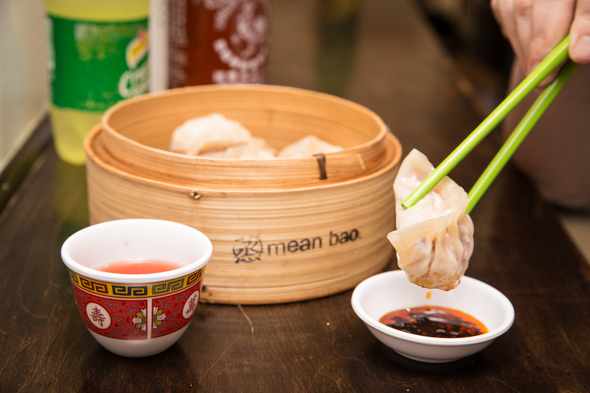 Aside from bao, the menu also offers siu mai ($3.80), dumplings ($3.80) and stuffed tofu pockets ($4.50). 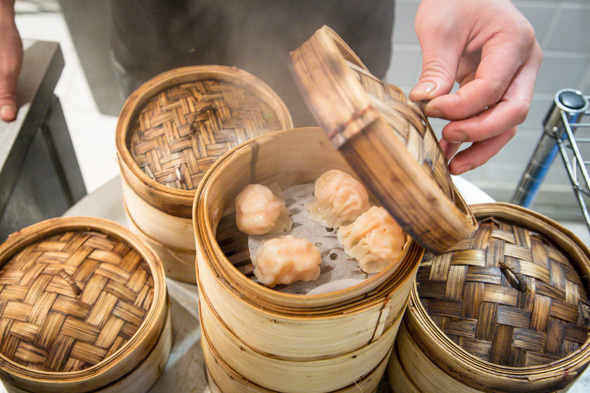 I try the pleasantly sweet pork dumplings, studded with chunks of crunchy cabbage for texture. Dips like tangy ginger red wine vinegar and chili oil are advised to add a little zing, but there's also squirt bottles of sriracha, hoisin and soy sauce supplied at the condiment bar for DIY application. 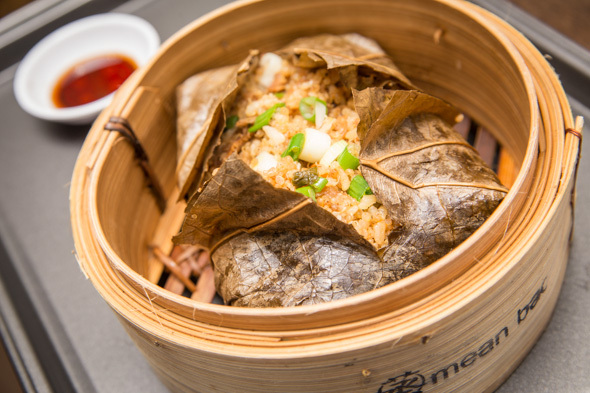 One dish I haven't ever seen elsewhere is the lotus leaf-wrapped sticky quinoa ($6.50) mixed with white and brown Japanese rice, a potpourri of textural surprises like chunks of sweet and salty lap cheong sausage, chicken, shiitake mushrooms, scallions and bamboo shoots. A cooler full of drinks features a selection of Urban Zen aloe teas, coconut water and some unusual sodas, like imported Asian Schweppes cream soda. 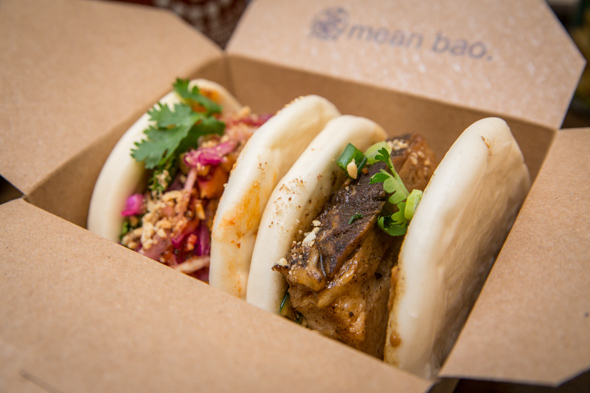 Mean Bao seems positioned to do well here: its entire menu can be dished-up impressively quick, while the price points are especially wallet friendly.